Raheem Sterling has hit out at Leonardo Bonucci's comments that the racist abuse suffered by Moise Kean was partially his own fault by describing them on social media as "laughable". 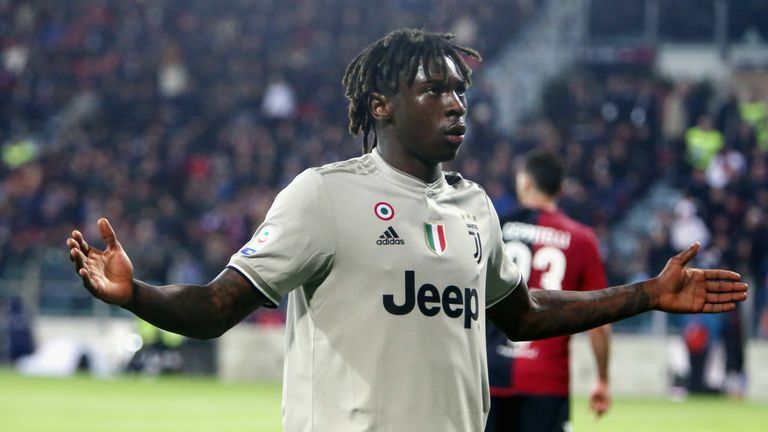 Bonucci suggested Juventus team-mate Kean was '50-50' to blame for the racist abuse during the game at Cagliari, and the Manchester City forward responded in an Instagram post with pictures of laughing faces with the comment: 'All you can do now is laugh'. Former Chelsea Women forward Eniola Aluko, who joined Juventus Women in June, also came to the defence of Kean. Aluko wrote on Twitter: "I choose to support my Juve counterpart not blame him. "The good news is the ignorant idiots of Cagliari are going absolutely nowhere in life, whilst Kean is a rising superstar and (Blaise) Matuidi a World Cup winner. I also focus on that. "Kean 1 Racist Cagliari idiots 0"
Manchester United midfielder Paul Pogba, who used to play for Juventus, was another to express his support for Kean on social media. Pogba wrote on Instagram: "I support every fight against racism, we're all equal." Pogba added in Italian: "Good Italians wake up, you can't let a small racist group speak for you. #equalgame #respect". Kean was racially abused by home fans as the Serie A leaders won 2-0 at Cagliari, but the 19-year-old took a stance of defiance after scoring a late second goal. Moise Kean took a stance of defiance to the racist abuse he received against Cagliari after scoring in a 2-0 win for Juventus. The Italy international was abused all night by sections of the home support, with monkey chants aimed at him, but had the final say by netting Juve's second goal with five minutes left. The teenager stood at the post, his arms aloft in response to the chants. and Bonucci claimed after the match that Kean should not have provoked the home fans. He said: "There were racist jeers after the goal, Blaise [Matuidi] heard it and was angered. I think the blame is 50-50, because Moise shouldn't have celebrated like that, and the Curva should not have reacted that way." Juve boss Massimiliano Allegri also felt that the teenager should not have responded to the racist chants - but called for the "idiots" responsible to be handed lifetime bans. "He shouldn't have celebrated in that manner," he said. "You need great intelligence to deal with these situations and should not go to provoke people. That, of course, does not mean the idiots in the crowd and the way they reacted should be justified. "We need to use the cameras, find those who are doing it and punish them. It's very simple, identify them, and not one-year ban or two, just give them a lifetime ban." The incident came eight days after England players were subjected to racist abuse during their Euro 2020 qualifier in Montenegro, and on the day UEFA president Aleksander Ceferin insisted referees would be told to be "brave" and halt matches to stamp out such abuse from "loud, aggressive and primitive" people.